A daily nasal rinse may help prevent proliferation of H1N1 virus. Fresh ginger root can be used to make tea. Drink lots of fluids. Herbs that can help boost your immune system. "Oven fried" oysters contain high quantities of zinc without the fat. The CDC has already told you to wash your hands, cough in your sleeve, not to touch your nose, eyes or mouth and to get vaccinated. In addition to these, there are many other things you can do to strengthen your body’s natural defenses. Your body is designed to heal itself but it can only do so with your help. Below I will discuss stress, rest, salt water rinsing, the importance of taking in adequate liquids, vitamins, minerals, herbs and probiotics. I'll share a simple recipe for chicken soup, lemon ginger tea with honey and echinacea and a recipe that boosts your zinc levels. Have you ever come down with a cold a few days after a big fight with your spouse or right before a final exam or a make-or-break meeting with a key customer? Stress can lead to a weakened immune system and make you more susceptible to catching a cold or the flu. It may also intensify your cold and flu symptoms. It’s pretty difficult to avoid the stresses in life but how you react to them is under your control and can make all the difference in the world. A lot of stress is self induced so cut yourself some slack this flu season. Try meditating, exercising, thinking positive thoughts, stretching or visualizing yourself on a beach in Hawaii (that’s my favorite). Getting enough rest is key to both preventing and fighting the flu. A study published in the Journal of the American Medical Association in 2002 showed that healthy young adults who had only 4 to 6 hours sleep per night got less than half the benefit of a flu vaccine than those who were well rested. This is very important in our current situation where H1N1 is targeting healthy young adults who may think they are protected once they are vaccinated. Bottom line is, get more sleep. If you already have the flu, stay in bed and get as much rest as possible. Going to work or shopping only worsens your symptoms, delays recovery and exposes others to the flu. One of the simplest and most effective things you can do is gargle and rinse your sinuses with warm salt water. This can effectively prevent the proliferation of the flu virus. Gargling a few times a day is simple enough but many of you may be put off by sinus irrigation. Neti pots have been used for centuries and originated in Ayurvedic medical traditions. They look like little tea pots and I must admit I’ve never been excited about using these to pour warm salt water in my nose. But last year I found a very simple device, a well designed plastic bottle that does the same thing. It even comes with pre-measured salt packets. It’s called the NeilMed Sinus Rinse kit, invented by Dr. Mehta. It’s easy to use and it's great for allergies too. It's important to stay hydrated when you have the flu, especially if you are vomiting or have diarrhea. Juice, herbal tea and broth are best. I avoid caffeinated beverages since they are dehydrating and will stimulate you when you should be at rest. One exception is green tea which contains the immune boosting chemical EGCG. Avoid drinking milk or giving it to your child since dairy is very mucus forming. Avoid alcohol as it is dehydrating and can weaken the immune system. My favorite tea, especially when I’m congested or have an upset stomach, is fresh ginger tea. Steep ginger and Echinacea in boiling water for 15 minutes. Add raw honey and the lemon juice. Strain and serve. For an easier version of this, prepare a cup of organic ginger tea (My favorite is from Traditional Medicinals). Add a tablespoon of honey, a wedge of fresh lemon and Echinacea tincture (according to manufacturers directions). * Ginger is a “warming” herb, controls nausea, and reduces phlegm in the upper respiratory tract. Echinacea is an herb used to build the immune system and reduce the duration of colds and flus. Honey is known to have antibacterial, antiviral and antifungal properties and can help relieve a sore throat. (Children under 1 year of age should avoid honey as it may contain bacterial spores that can cause infant botulism). Lemon juice provides vitamin C, an important antioxidant. Chicken soup, also known as Jewish penicillin, has long been known to treat the common cold. This may be more than folklore. A study conducted at the University of Nebraska Medical Center showed that Chicken soup actually mitigates upper respiratory tract infections by stopping the migration of white cells into the bronchial tubes. See “Chicken Soup Research” . Here’s a very easy chicken soup recipe. If you eat chicken, please make sure it is truly free range from a local farmer. Industrial farming has led to unthinkable mistreatment of chickens. Place chicken in water and bring to a boil. Chop garlic and set aside for at least 15 minutes before using to get maximum benefits. Add ginger, onion, celery, thyme and bay leaf. Simmer 45 minutes partially covered. Add the garlic and carrots and simmer an additional 45 minutes, partially covered. Remove bay leaf, pieces of ginger or ginger tea bags. Remove the chicken, take the chicken off the bone, cut in small pieces and return to pot. Add fresh spinach and cook several minutes until it wilts. Turn off the heat and add fresh parsley, and salt and pepper to taste. Serve as is or over cooked noodles. If you can find home made noodles, they can cook right in the same pot with the soup in only a few minutes making this a one-pot meal. Throw them in at the same time as the spinach. If you are going to freeze the soup, do not add the pasta as it will get soggy. If you use dry noodles, cook them separately according to manufacturers directions. My favorite herbs for building up my immune system before or during the flu are Echinacea and Astragalus. You will often see them together in one capsule. I also use Elderberry syrup to boost my immune system, help with coughs and to fight the flu and colds. Mushrooms are also known to have many therapeutic effects (See the therapeutic effect mushroom chart). Cortyceps, Reishi, Maitake and Shiitake boost the immune system and have anti-bacterial and anti-viral properties. Cortyceps, Reishi and Maitake also provide lung and respiratory support. Some of my recipes that feature this longevity food are: Barley and Mushrooms and Raw Marinated Mushrooms. Garlic is also a power food, rich in allicin, a sulfur-containing compound that gives garlic much of its anti-inflammatory, antibacterial and antiviral properties. Allicin is not produced until the garlic is crushed or chopped so wait 15 minutes before eating or cooking to get maximum benefits. Get some raw garlic in your diet by grating it in your salad dressing (see Home Made Balsamic Vinaigrette and Bread Dipping Sauce) or in one of my Pesto Recipes. **Please note, any herbs noted here to boost the immune system are not recommended if your are taking immunosuppressants used to treat cancer or suppress the immune system following an organ transplant). Vitamin A, also known as beta-carotene or retinol, is important for a proper functioning immune system. It helps protect tissues during infections and accelerates recovery time. You can get your daily requirement from one full teaspoon of cod liver oil, about ¼ cup of raw carrots, cooked sweet potatoes or butternut squash or ½ cup of chopped raw kale. Other good sources are liver, pumpkin, turnip and mustard greens, sweet red pepper, dried apricots and cantaloupe. Here are a few recipes that are high in vitamin A: Healthy Mac and Cheese, Carrot, Celery, Apple, Beet, Ginger Cocktail, Spicy Butternut Squash and Red Lentil Soup, and Vegan Pumpkin Soup with Curried Gravenstein Apples. An important antioxidant, vitamin C supports a healthy immune system. It’s lost in cooking so it’s important to obtain this vitamin from raw food. You can get your daily requirement from one half a cup of raw red pepper slices, ¾ cup of chopped raw kale, one half of a guava fruit, one medium kiwi, one small papaya, six large strawberries or 1/2 cup of fresh orange juice. So enjoy raw fruit and fruit juices or make a Raw Kale, Corn and Red Bell Pepper Salad. Known for its importance in calcium metabolism and bone health, vitamin D deficiency has been linked to a host of other conditions. Recent studies are suggesting that vitamin D is important to the immune system and a deficiency of this vitamin may lead to being more susceptible to colds and flu. The current RDA of 400 to 600 IU but many health care professionals are now recommending 1,000 IU per day or more. Other than mushrooms, there are no plant sources of this vitamin. (Exciting news on that front shows that mushrooms exposed to ultraviolet B light for 5 minutes may have as much as 3,500 IU of vitamin D! Keep an eye out for mushroom products with high vitamin D content). You can get 1,000 IU of vitamin D from 2 heaping teaspoons of cod liver oil, a cup of pickled herring, 6 ounces of canned pink salmon, 2 dozen raw Eastern wild oysters. It is also found in fortified orange juice and dairy and non-dairy milk products. Although vitamin D is manufactured by the body when exposed to direct sunlight, nearly three quarters of U.S. teens and adults are deficient according to findings in the Archives of Internal Medicine. Deficiency is much higher among people of color. This is one of those vitamins where eating food may not be enough and supplements should be considered. When shopping for supplements, remember that D2 is the vegan form of vitamin D and D3 is derived from sheep’s wool. Vitamin E is a powerful antioxidant known to protect cell membranes. Studies have suggested it can help fight the flu by boosting the immune system. You can get your daily requirement with 1 cup of Kellogg’s All-Bran Complete wheat flakes or other fortified cereals, 3 tablespoons of vitamin and mineral fortified peanut butter, 5 tablespoons almond butter, 3 tablespoons of sunflower oil, 1 1/3 cups dried sunflower seeds or 1 tablespoon of wheat germ oil. A recipe high in vitamin E is Faux Tuna Fish Salad Stuffed Heirloom Tomato (a raw vegan recipe made with vitamin E rich sunflower seeds and almonds). A major antioxidant, this vitamin protects cell membranes and its bioavailability is enhanced by vitamin E. One study showed that viruses in bodies deficient in selenium could mutate into more damaging forms. But look no further than the Brazil nut to get what you need. One single kernel provides more than 100% of your daily requirements! Get both vitamin E and selenium (and more) in this Blueberry Smoothie recipe. Substitute 1 cup of strawberries for any of the fruits to provide additional vitamin C.
This important vitamin supports growth, immunity, detoxification, wound healing and other key body functions. Zinc has long been associated with colds and flus as it helps the body fight viruses and bacteria. It is commonly found in throat lozenges and cold medications. The best source of this vitamin is oysters. A half dozen medium cooked oysters provides 76 mg of zinc or 5 times your daily requirement. If oyster shooters aren’t the first thing you crave when you are sick with the flu, adequate zinc is readily found in a serving of fortified cereals like Kellogg’s All-bran complete wheat flakes or General Mills Multi-grain Cheerios. Or, get some zinc throat lozenges. Here’s a simple oyster recipe just in case you want to get your zinc fix the natural way. Preheat oven to 400 degrees. Clean oysters well. Dip in egg and then in seasoned bread crumbs. Place on a cookie sheet lightly greased with olive oil. Sprinkle with salt, black pepper and garlic powder, to taste, and spray with olive oil Pam. Cook for 20 minutes or until golden brown. Serve with a wedge of lemon or a cocktail sauce made of organic ketchup and horseradish. Probiotics are the friendly bacteria found in your body’s digestive system. Studies have shown that a healthy gut can help you fight colds, recover quicker and require less antibiotic use. Probiotics are found in yogurt, kiefer, raw saukraut, kombucha (a fermented tea), Rejuvelac (a fermented beverage popular in the raw food community), and in supplements. Try Cantaloupe soup with Goat Kefir for a chilled soup rich in probiotics, vitamin A and vitamin C.
This may be the hardest thing for some of you to do, but if you have a cold or flu, avoid smoking as this may delay recovery and cause additional respiratory issues. In fact, this might be a good opportunity to quit permanently. CONGRATULATIONS to my cousins Lorraine and Paula who decided to kick the habit this month! Cheese sauce from blended cheese and cooked butternut squash. I would venture to guess most kids in America eat lots of mac and cheese. I know mine did when they were young. It's one of the greatest comfort foods of all times. Unfortunately it doesn't provide the fiber and nutrients that we all need nor does it contribute to the 5 required servings of vegetables per day. I am extremely excited about this recipe because after much experimentation, I figured out a way to make a delicious mac and cheese that provides lots of fiber, protein, vitamin A, calcium AND 2 servings of veggies that your kids will happily eat! Regular macaroni and cheese is basically pasta made from white processed wheat covered with lots of high fat cheese, butter and cream. It's extremely high in fat and has almost no fiber content or beneficial plant chemicals. The first thing you can do to make it healthier is to use whole grain pasta. Today, there are more and more whole grain brands and shapes to choose from on the market. For this dish, I use whole grain Fusilli but you can use the traditional elbow, shells or whatever whole grain product appeals to you or your children. A serving of whole grain pasta typically provides 5 grams of fiber. The next thing you can do to make mac and cheese healthier is to reduce the cheese while still maintaining a creamy, cheesy sauce. This can be achieved by blending a single ounce of a good quality, full fat, sharp cheddar with some low fat cottage cheese and 2 cups of cooked butternut squash. Adding the squash provides 2 full servings of veggies and 3 times the daily requirement of vitamin A per serving. Its bright orange color, an indication of its high carotenoid content, blends well with the color of the cheddar making it a great way to “slip” this important veggie into your kids’ favorite dish! If you are really trying to restrict your fat intake, you can lower the fat content even more by using fat reduced cheddar and 1% low fat cottage cheese. This only reduces the calorie content by 4% but it decreases the total fat an additional 22%, saturated fat by 39% and cholesterol by 33%. But even if you use full fat cheddar and 2% cottage cheese, the recipe still only has a total of 3.8 g of saturated fat and only 20 mg of cholesterol. A small price to pay and it tastes like “the real thing”. If you are going to bake the final dish before serving, preheat the oven to 350 degrees. Cover the butternut squash with an inch and a half of water and gently boil it, covered, until soft - about 10 minutes. While the squash is cooking, prepare the pasta according to directions. In a small pan, sauté the onion in olive oil until soft, about 5 minutes. Drain the squash reserving 1/4 cup of the cooking water. Put the drained squash and reserved cooking water in a blender with the cheddar cheese, cottage cheese and salt and blend until smooth. In a large bowl, combine the drained pasta, the cheese sauce and the cooked onions and gently mix until the pasta is evenly coated with the sauce. If warm enough, you may serve it now. Or, you can put it in a lightly greased casserole dish and warm it in the oven for 15 minutes. Serve with freshly ground black pepper if desired. Per serving using whole fat cheddar cheese and 2% low fat cottage cheese: 404 calories, 9.3 g fat, 3.8 g saturated fat, 20 mg cholesterol, 18.5 g protein, 63.8 g carbohydrates, 8.8 g of fiber and 250 mg of calcium. Per serving using reduced fat cheddar cheese and 1% low fat cottage cheese: 387 calories, 7.3 g fat, 2.3 g saturated fat, 13.5 mg cholesterol, 19 g of protein, 64.3 g carbohydrates, 8.8 g fiber and 258 mg of calcium. This very easy salad looks and tastes like fall with apples and cranberries. It is also packed with healthful ingredients. Since all the ingredients are "raw", you are getting the maximum benefits from the vitamins, especially vitamin C that is easily destroyed in the cooking process, as well as the live enzymes. Besides being high in vitamin C, apples are rich in fiber known to protect the heart, control blood sugar and protect against cancer. Cranberries have been shown to protect against urinary tract infections. Raw walnuts and chia seeds are high in omega 3 fatty acid whose anti-inflammatory properties help protect the heart and cognitive function, and prevent arthritis and other inflammatory conditions. Each serving of this recipe provides 1.1 g of omega 3 and 3.0 g of omega 6. It also provides nearly 4 grams of fiber. I've always wondered why Waldorf salad, full of delicate, fresh ingredients, was commonly made with a heavy, oily mayonnaise dressing. To lighten it up, I use a tangy fruit juice dressing with lemon and apple juice, sweetened with a little raw agave syrup and thickened with hydrated chia seeds. Early in the day, mix dried chia seeds into filtered water. Let sit for several hours until it forms a gel. In a small bowl, combine agave syrup, apple juice and lemon juice with the chia gel. Set aside. Combine apple, celery, cranberries and English walnuts. Add the apple chia dressing and mix together. Spoon each serving onto a small leaf of butter lettuce. Per serving: 139.2 calories, 5.7 g fat, 0.6 g saturated fat, 0 g cholesterol, 1.7 g protein, 21.4 g carbohydrates, 3.9 g fiber, 1.1 g omega 3 and 3.0 g omega 6 fatty acid. This recipe was revised on January 25, 2010. I increased the amounts of chia seeds, agave syrup, apple and lemon juice and diced apple. I changed the number of servings from 2 to 4. We had a terrible storm this week here in northern California. It certainly wasn't as bad as some of the snow storms I've seen on TV in the mid-west. But no matter where you are at this time of year, the change of weather makes you think of hot soup. Split pea soup is one of my favorites. 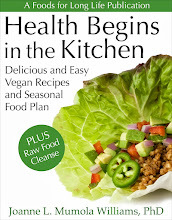 You can find my recipe for Raw Vegan Split Pea Soup on my May 12th, 2009 post. But when the cold weather hits, I eat more cooked food so I offer you a healthy recipe for this popular winter soup - one without a fatty ham hock! Split peas are green peas that were picked at the peak of their goodness and dried. Rich in fiber, split peas can help reduce cholesterol and balance your blood sugar. This makes them an excellent food for those with diabetes or hypoglycemia. Only 1½ cups of cooked split peas provides 100% of your daily fiber requirements. Besides fiber, they are an excellent source of molybdenum, needed by the body to produce sulfite oxidase, an enzyme that detoxifies sulfites. If you have a bad reaction to sulfites, you may be deficient in molybdenum. Split peas are also rich in manganese, folate, vitamin B1 (thiamin), potassium, phosphorus, magnesium, copper, iron and zinc. A one pound bag of split peas cost a little over $1 so this recipe is not only very nutritious, but you can feed your whole family this healthy, filling soup for just a few dollars. Sort though peas and remove small stones and clumps of dirt. Rinse well. In a 5 1/2 quart Dutch oven or soup pot, combine split peas, onions, celery, garlic, salt, cumin, coriander, black pepper, water and bay leaf. Bring to a boil. Reduce heat and cook, partially covered, for 30 minutes or until peas are soft, stirring occasionally. Add potatoes and cook another 30 minutes or until the potatoes are soft, stirring more frequently. Add more water any time during cooking if needed. Remove the bay leaf and put soup in a blender and process until smooth. This may take 2 batches depending on the size of your blender. Make sure the top of the blender is firmly in place and the speed setting in initially on low (unless you want green peas on your ceiling). Return soup to the pot, add carrots and simmer, partially covered, until the carrots are soft, around 15 to 20 minutes, stirring occasionally. Adjust salt if needed, serve and top with freshly ground pepper if desired. Per serving: 321.8 calories, 0.8 g fat, 0.2 g saturated fat, 0 g cholesterol, 20.8 g protein, 60.8 g carbohydrates and 22.8 g of fiber. My second crop of green beans are coming in and the bell peppers are turning red. It's time for a stir fry! I have a non-stick electric wok which makes it quick and easy to prepare a low calorie dinner with my garden veggies and some fresh shrimp. Stir fries can be served on top of brown rice. Although shrimp are high in cholesterol (166 mg in a 3 oz serving), they are very low in saturated fat. A three ounce serving has only 84 calories and less than a gram of fat. Although many avoid shrimp because they fear a negative impact on their blood cholesterol levels, research investigating blood cholesterol levels and shrimp consumption does not justify this. Shrimp are a good source of niacin (2.2mg per 3 oz serving), iron (2.6 mg), phosphorus (116 mg) and zinc (1.3mg). They are a very good source of protein (17.8 g per 3 oz serving), vitamin B12 (1.3 mg), vitamin D (121.8 IU) and selenium (33.7 mcg). They are very low in mercury and contain 295 mg of omega 3 fatty acid, 268 mg of which are the beneficial EPA and DHA. * If the green beans are not young and tender, steam for 5 minutes before adding to stir fry. Prepare brown rice according to directions. This will take around an hour in a sauce pan and almost 2 hours in some rice cookers so start this well in advance of making the stir fry. Place the cleaned shrimp in a small bowl with 1 clove of minced garlic, 1 teaspoon of olive oil, 2 teaspoons of soy sauce and cayenne pepper to taste. Set aside and marinate briefly while you are preparing the vegetables and the mango. About 15 minutes before the rice is cooked, heat the wok and stir fry the shrimp and their marinade until they begin to turn pink, around 2 minutes. Remove shrimp from the wok and set aside. Heat the rest of the olive oil in the wok and briefly stir fry the onions, garlic and ginger (about 30 seconds or until fragrant). Add the green beans, bell pepper,cabbage and the soy sauce and cook for about 8 to 10 minutes until the veggies are crisp tender, stirring often. Add the mango and cook until heated. Return shrimp to the wok to heat, mixing thoroughly. Season with black pepper to taste and serve over brown rice. Per serving (without rice): 224.8 calories, 5.8 g fat, .8 g saturated fat, 166 mg cholesterol, 21.2 g protein, 23.2 g carbohydrates, 5.3 g fiber, 376 mg omega 3 and 516 mg omega 6 fatty acids. Per serving (with 1/2 cup cooked brown rice): 332.8 calories, 6.8 g fat, .8 g saturated fat, 166 mg cholesterol, 23.7 g protein, 45.7 g carbohydrates, 7.3 g fiber, 390 mg omega 3 and 818 mg omega 6 fatty acids. Cooked pumpkin pulp scraped from baked pumpkin halves. ENER G egg replacer. 1 1/2 t in 2 T water = 1 egg. Pumpkin walnut bread cooling on a rack. Judging by the large number of hits on my August 30th post, When to Harvest and How to Cure Pumpkins and Winter Squash, I know there are many gardeners out their with pumpkins waiting for healthy recipes. I’ve already posted two: Vegan Stuffed Sugar Pumpkin with Quinoa, Pecans, Cranberries and Apples and Creamy Vegan Pumpkin Soup with Curried Gravenstein Apples. Today I will add a pumpkin bread recipe, made with whole grain goodness, omega 3 rich walnuts and to save calories and cholesterol and for the benefit of those who avoid eggs, this is made with EnerG egg replacer. Each slice has over 2 grams of fiber, has zero cholesterol and 484 mg of omega 3 fatty acid. Although I love to eat fresh organic, cage free, omega 3 eggs, I try not to eat too many. When I was tested for food allergies, the only things I was allergic to were egg whites and egg yolks. I could have guessed that since almost every time I eat poached eggs, I immediately get a headache, a little dizzy and sometimes nausea. My husband warns me of this, to no avail, every time I start to eat this breakfast treat. 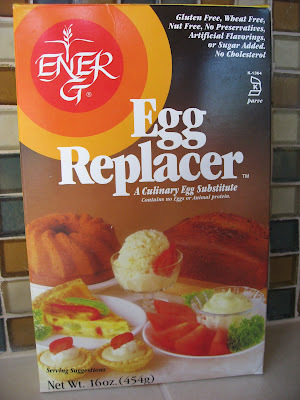 When I bake, it’s easy to avoid eggs because of this egg replacer product. I was certainly skeptical at first, knowing how nicely cakes and breads rise with real eggs, but so far, every time I’ve tried using it in baking recipes that call for eggs, this product has worked like a charm. I didn’t like it in lemon pie filling, however, since it doesn’t produce a nice yellow, lemony color. To use it, you just mix 1½ teaspoons of egg replacer with 2 tablespoons of warm water thoroughly before adding it to the recipe. It’s made mostly from potato starch, tapioca flour and leavening. Each ENER G egg equivalent only has 15 calories and no cholesterol. To compare, one large egg has around 70 calories and 211 mg of cholesterol. Of course you can’t use this product to make scrambled or poached eggs. But it works perfectly in our Vegan Whole Grain Pumpkin Walnut Bread recipe. One note of caution; use the egg substitute immediately after mixing with water and put the bread in the oven to bake quickly. If the mixture sits around, it may not rise properly. If you do want to use eggs, just replace the EnerG egg replacer and the 1/4 cup of water with 2 slightly beaten eggs. * To make pumpkin pulp from fresh pumpkin, preheat oven to 350 degrees. Line a roasting pan with aluminum foil. 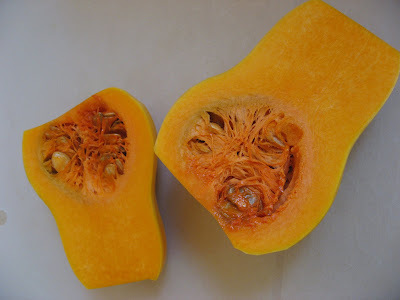 Cut pumpkin in half, remove seeds and strings and place hollow side down in the roasting pan. Bake for 1 hour or until soft. Cool a bit and scrape the pulp out with a large spoon. Reserve 1 cup for this recipe and freeze the rest in 1 cup servings. In a large bowl, combine flour, salt, baking soda, baking powder, nutmeg and cinnamon. In another bowl, mix together pumpkin pulp, vanilla, Sucanat, olive oil and apple sauce. Mix ENER G in warm water thoroughly and add to the pumpkin mixture (or add 2 slightly beaten eggs instead for a non-vegan version of this recipe). Add pumpkin mixture to large bowl with dry ingredients and beat with a hand mixer until smooth. Fold in walnuts and raisins. Pour into a well greased 8.5"x4.5" loaf pan and bake for 55 to 60 minutes or until a toothpick inserted in the middle comes out clean. Remove from oven and let sit in the pan for 15 minutes on a metal rack. Remove from pan and let loaf cool on the rack for another 15 minutes. Cut into slices and serve. Per serving: 174.9 calories, 8.1 g fat, 1.0 g saturated fat, 0 g cholesterol, 3 g protein, 23.5 g carbohydrates, 2.3 g fiber, 484 mg omega 3 and 2409 mg omega 6 fatty acids. 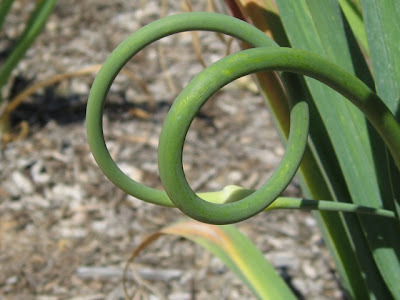 Growing Garlic in your Home Garden - It's Time to Plant! Separate your harvest and save the largest bulbs for planting. Plant with the cloves pointed up. Hardneck scapes. Some gardeners clip them off for bigger bulbs. Growing garlic in a home garden is actually pretty easy. Watered by the winter rains and eschewed by most bugs, it practically takes care of itself. Doug and I have been growing it for years and have planted many different types that you could never find in grocery stores. If cured properly, it will keep for many months (see my post on Harvesting and Curing Garlic). Once you’ve eaten home grown garlic, you will want to grow your own forever. Your friends and neighbors will also enjoy receiving these little exotic jewels from your garden. Garlic is also a nutritional power food. It has been associated with cancer prevention, lowering cholesterol, bolstering immunity, cleansing blood and having antibiotic, antiviral, anti-parasitic and anti-fungal properties. Its powerful phytochemicals include saponins, quercetin and organosulfurs like allicin. Their disease fighting qualities are enhanced when the garlic is chopped and set aside for 15 minutes before being heated. It's even more powerful if eaten raw. The best time to plant is in the fall. The goal is to plant when the weather is still warm enough that the cloves will germinate before it gets too cold. Plant 4 to 6 weeks before you experience ground freezing. Here in Northern California, I usually plant sometime in October. In warmer climates, like Texas, mid to late October is recommended. In mild climates like these, we've actually planted even later in the fall with successful results but, then again, it rarely freezes here. In a few weeks after planting, you'll see green shoots sprouting up. Garlic likes sunshine, so pick a sunny spot in the garden. It does best in a sandy-clay-loam soil with a pH around 6.5 and good drainage. If the soil doesn’t drain well, the growing bulbs will rot. Soil should be cultivated with plenty of organic matter, like well composted manure, down at least 6 to 12 inches. Garlic roots will grow nice and deep if the soil is well prepared. There are so many interesting varieties of garlic available. If the local nursery has a good selection, that’s great. But please, resist the urge of picking up a packet of shriveled old bulbs in the local hardware store. Check out some of the interesting organic garlic stores online that offer a better selection. Last year I planted 4 different softnecks (Early Red Italian, Kettle River Giant, Susanville and Siciliano) and one hardneck (Killarney Red). One year I really got carried away and planted over a dozen varieties and nearly 400 plants. Make sure you save the biggest bulbs from your harvest for the next years planting. To buy new garlic stock, I go to The Garlic Store in Colorado. My friend John has had good success with a Texas company, Gourmet Garlic Gardens . They offer helpful information about their stock and what may grow best in your area. They also sell “sampler packs” so you can try different varieties. But hurry, I’ve noticed that stock is selling out quickly. After you’ve prepared your garden, separate the garlic bulbs into individual cloves. Do not do this more than 1 to 2 days before planting or they will dry out. The biggest cloves are said to produce the biggest plants so plant the big cloves and eat the smaller ones. Plant the cloves with the pointy side up and the flat root side down. If the ground is soft, push the cloves in with your finger. I usually use a dowel or a broom handle to poke holes in the dirt and drop the cloves in the holes and cover them with an inch of soil. The bottom of the clove should be about 2 inches below the surface. The recommended spacing is 4 to 6 inches apart. I like to pack them in to discourage the weeds so I also plant the rows 6 inches apart. Every 6 rows I leave a 2 feet space so I have room to walk through and weed. To cut down on weeds and to keep the little plants warm, I use mulch. If you are planting more than one type of garlic, keep a log and a little map of the quantity and location of each variety. Keep them separated when harvesting, curing and storing. This is necessary in order to identify the stock for the following year’s planting. We water regularly after planting and during germination but since we are in a climate where it rains all winter, we don’t water again until spring. If you are in a drier climate, you should water during the winter and the spring. You should stop watering during the last 4 weeks of growth, around mid to late June. This allows the wrappers to dry out. Besides the manure that is worked into the soil before planting, we fertilize twice with seaweed fertilizer, once after the shoots appear and once again in the spring. The Garlic store warns not to fertilize after late May or it can actually cause smaller bulb size. Liquid fish fertilizer can also be used but it smells a lot worse than seaweed. 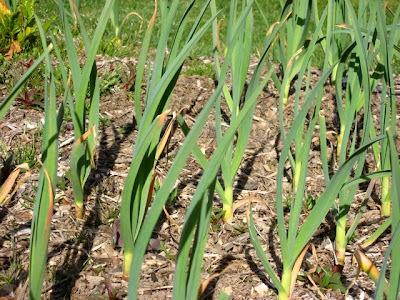 Garlic plants hate weeds so don’t let them take over. 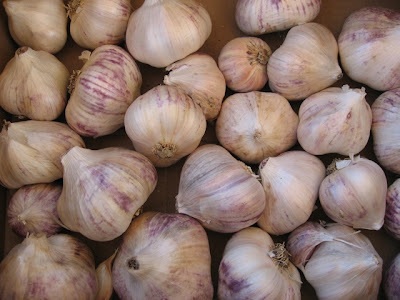 For harvesting information, see my post on Harvesting and Curing Garlic. Although you won’t need this for many months, it’s fun to see what you have to look forward to! Vegan Stuffed Sugar Pumpkin with Quinoa, Pecans, Cranberries and Apples - Happy World Vegetarian Day! Pre-bake hollow sugar pumpkin before stuffing. Red, standard color and black quinoa. Rinse quinoa very well to remove bitter taste. Quinoa is cooked when liquid is absorbed - around 15 minutes. Cut the stuffed pumpkin in half for a single serving. October 1st is World Vegetarian Day - the annual kickoff of vegetarian awareness month. Eating meatless meals can reduce the risk of heart disease, stroke and cancer and prevent exposure to food-borne pathogens. It provides a viable solution to world hunger through more efficient use of grains. To learn more about the benefits of vegetarian eating and to receive a free 16 page booklet, visit the North American Vegetarian Society website. Native to South America, it was considered a sacred staple of the Incas because of its exceptional nutritional value. Quinoa is used as a grain (even though it’s not actually a grain) and is more commonly found in vegetarian cooking because of its excellent balance of all nine essential amino acids. It is also a very good source of manganese and a good source of magnesium and phosphorus. One half cup of cooked quinoa contains 111 calories, 2 grams of unsaturated fat, no cholesterol, 19.5 g of carbohydrates, 2.5 g of dietary fiber and 4 grams of protein. Quinoa can be sprouted and used in raw vegan cuisine or it can be cooked in only 15 minutes to get a delicate, light dish resembling couscous. It’s very important to rinse quinoa thoroughly or it may taste bitter. Standard quinoa has a cream color but I also found some in red and black. For fun I mixed all three colors to make this pumpkin stuffing but of course, you don’t need to do that. If you are hosting a traditional Thanksgiving or holiday dinner this year and you find that one or more of your guests are vegan or vegetarian, delight them with this entree. Quite often at meat eating dinner parties, vegetarians must make their meal from "side dishes" always wondering if there's chicken broth in the stuffing. A festive, vegan stuffed pumpkin would make them feel very special. Of course if you are hosting a vegetarian Thanksgiving or holiday party, make lots of these for all of your guests! As beautiful and festive as this dish is, it's also packed with nutrients and phytochemicals, low in saturated fat, high in fiber and fairly low in calories (for such a filling entree). You can also use this quinoa filling to stuff acorn or other winter squash. Preheat oven to 350 degrees. Carefully remove the tops of the sugar pumpkins. Remove seeds and strings. LIghtly grease and salt the insides of the pumpkins, replace the tops and bake until the inside flesh is soft enough to be pierced by a fork (about 1 hour). Rinse the quinoa in a fine strainer THOROUGHLY or it may have a bitter taste. Bring water and salt to a boil. Stir in quinoa and simmer covered until all the water is absorbed (about 15 minutes). Add the apples, cinnamon, ginger and margarine to the hot quinoa and stir together. Mix in the cranberries and pecans. Remove cooked pumpkins from the oven and fill with quinoa mixture. Cover each pumpkin with foil and bake an additional 30 minutes. Remove from oven and let rest for 5 minutes. Remove foil, slice each pumpkin in half and serve. Per serving: 373 calories, 14.1 g fat, 1.6 g saturated fat, 0 g cholesterol, 9.3 g protein, 57.1 g carbohydrates and 8.3 g of fiber.